Keene City Hall is located at 3 Washington Street, Keene NH 03431; phone: 603-352-0133. Photo: Isaac Wyman House and Tavern, ca. 1762, 339 Main Street, Keene, NH. Listed on the National Register of Historic Places in 1972. Photographed by User:Ymblanter (own work), 2012, [cc-by-3.0 (creativecommons.org/licenses/by/3.0)], via Wikimedia Commons, accessed August, 2014. One of the principal townships in the county of Cheshire, was incorporated in 1752, and in 1810, contained 1646 inhabitants. The Ashuelot river passes through the town and receives here the eastern branch of Beaver Brook. In 1817 Keene contained a very handsome village of about 60 houses, a meeting house, gaol, and several stores. About a mile from the village a canal is cut from Ashuelot River on which is a woolen factory, oil mill, and several other mills. 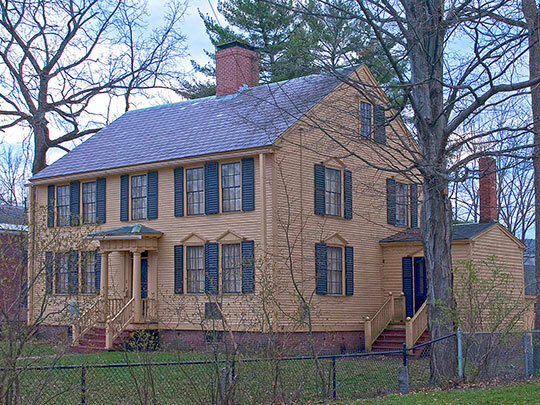 Nathan Blake settled here in 1736, having come from Wrentham, MA. The Reverend Jacob Bacon settled here in 1738. The town was formerly called Upper Ashuelot. Eliphalet Merrill and Phineas Merrill, Esq., A Gazetteer of the State of New Hampshire, C. Norris & Company, Exeter, 1817.